Suspicions of Russian meddling in U.S. elections were confirmed Monday, when in the course of the Wisconsin recount Russian hackers succeeded in adding 131 more votes to Trump's victory. "The real winners in this recount were the Russian hackers," DNC spokesperson Shepard Smith said in a statement during his regular FNC broadcast. "It is now absolutely clear that American election results accurately reflect the will of Vladimir Putin, regardless of whether the ballots were counted by hand or by machine." 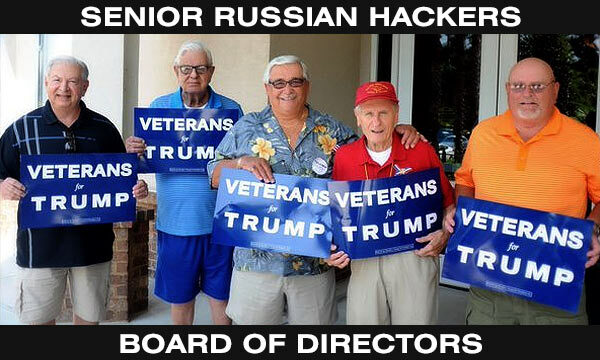 In the meantime, president-elect Donald Trump continued his post-election thank-you tour throughout the country, expressing gratitude to Russian hackers everywhere who helped him get to the White House. After making a stop in Cincinnati, Ohio, known for its thriving Russian hacking community, Trump went to Iowa, Michigan, and other predominantly Russian states whose hackers were vital to his win. At every leg of his tour, the president-elect's speeches attracted large crowds of enthusiastic Russian hackers, whose numbers turned out to be much greater than any Democratic strategist within the intelligence community had anticipated. "It's really terrifying that these tens of thousands of embedded Russian hackers look no different than everyday working class Americans," admitted John Podesta, a CIA insider responsible for the recent leak concerning RussiaGate to the Washington Post. Republican Speaker of the House Paul Ryan along with Senators Mitch McConnell, John McCain, and Lindsey Graham joined Podesta's condemnation of Russian hackers. "These Russians are not our friends," McConnell said. "Any influence on our predetermined elections coming from such far-away and foreign to us states as Iowa, Michigan, or Wisconsin is disturbing, unacceptable, and requires a bipartisan investigation." "It defies belief that some Republicans would be reluctant to investigate Russian hackers," McConnell said, adding that the hackers are hiding in plain sight. 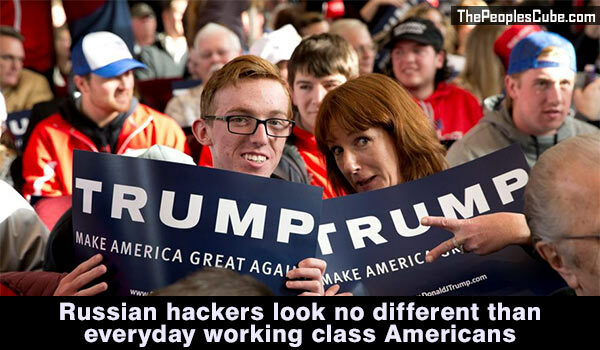 "Go to any Trump's rally - the place is packed with tens of thousands of Russian hackers. They're attracted to Trump like bees to honey. I demand that we investigate every single one of them." Our investigative team went to a Trump rally in West Allis, Wisconsin, hoping to interview some of the Russian hackers there. 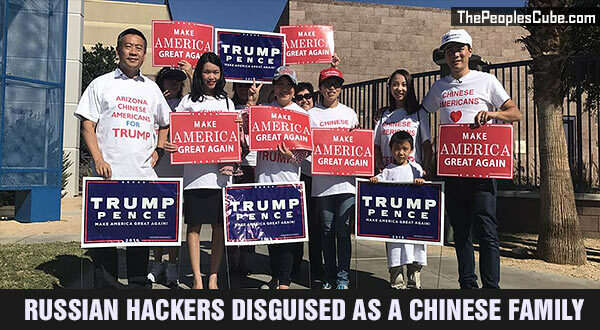 They were easy to spot by their red "Make America Great Again" hats - which, according to our CIA sources, Russian hackers wear to secretly identify themselves to each other. We approached an older Russian hacker posing as a U.S. Army veteran, who introduced himself as "Todd Rickenbacker." His surprisingly authentic Midwestern accent was a testimony to how meticulously Russians prepare their foreign implants. "Did I hack the U.S. election?" he repeated our question, feigning surprise. "You mean like with an axe?" Looking like a Norman Rockwell character, which only confirmed his deceitful intentions, he added, "Is that all you've got now? What happened to racism, sexism, and violence? That stuff isn't working for you guys anymore? Suppose this RussiaGate falls through as well, who will you blame then? Will you make up some new crap - or just go straight back to calling us racists?" "Todd" was interrupted by a dark-skinned Russian hacker named "Chuck," who looked African-American - most likely an elaborate makeup job that the KGB spies are notorious for. "Chuck's" authoritative tone suggested he was "Todd's" handler. "We're going to drain the swamp," he declared. "And all the establishment parasites pushing this RussiaGate nonsense, Democrat or Republican, they're the ones with the most to lose. They've panicked and abandoned all pretense. Good. We'll remember their names. What is your name?" Feeling threatened, we quickly walked away and approached a younger couple of Russian hackers nearby - a husband and wife, or that's what they wanted us to believe, who might as well be cast for the popular FX series, The Americans. They introduced themselves as "the Smiths" - obviously a fake name. "Yes, we hacked the election," the woman laughed, admitting her guilt. "Why don't you go ahead and arrest us - and everybody else in this room? There are only fifteen thousand of us here, and a couple thousand standing outside, waiting to be rounded up. And sixty one million more all over the country." Sixty one million Russian hackers operating in the United States? 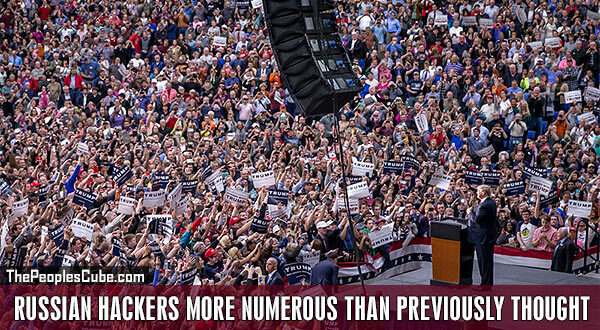 The divulged number was staggering. We felt lucky to have recorded her confession; it would be solid evidence during the upcoming investigation of foreign interference in our democratic process. "All we do is drink vodka and hack computers," her husband bragged. "Vodka gives us superpowers." "There was an entire billion-dollar American media machine working against Trump, with all its newspapers, websites, radio, and cable news channels," he continued. "There also was a billion-dollar American music industry, and the entire American movie industry that went out against Trump, with all the American actors, producers, and all kinds of celebrities agitating against Trump. Then there was this intense anti-Trump indoctrination in American public schools, colleges, and universities. Most importantly, there was this massive and powerful political establishment, both Democrat and Republican, that was determined to crush Trump." "Taken together, it's the mightiest empire known to man," he continued. "And then some vodka-swilling Russian hackers show up and knock it down with one hack. Can you believe that? Powerful stuff, that vodka. You should try it sometime. But it has to be made of beets or it won't work." "Please describe how exactly you were able to hack into all these voting machines if they weren't hooked up to the Internet," we asked, hoping for more groundbreaking revelations. "We didn't," he said. "The only charge, still unproven, is the theft of a bunch of emails showing how the Democrats were conspiring to steal the election. Russians didn't write those emails, America's top Democrats did. So they are now accusing Russians of trying to rig the election by showing everybody how the Democrats were trying to rig the election. Shouldn't there be a bipartisan commission to investigate the Democrats?" At that point a senior Russian hacker stepped out of the crowd and started speaking directly into the camera. "You commies know more about RussiaGate than we do," he shouted. "You always depended on Russia for everything. When we said 'Russian propaganda,' you called it 'Red Scare' to ridicule us. Without Russia you wouldn't know what to say, how to think, or how to present the news. We lost Vietnam because of it, and we almost lost America because of it. Of course you'd think nothing ever happens without Russia. How more revealing can you be?" A fellow senior Russian hacker stepped in to explain. "What Ronnie is trying to say here is that you commie scumbags loved the KGB propaganda and profited from it, but the one time Russia told the truth, you clutch you pearls and demand smelling salts." At that point we had all the information we needed. We went back to our Washington, DC, headquarters, congratulating each other on a successful investigative mission. But something we had heard kept nagging at us: what if we succeed in proving that Russian hackers were, in fact, the reason for Trump's victory? Wouldn't that take away our ability to blame his victory on white supremacism? To give up a premise that allows us to call half of Americans racists was the toughest decision we faced in our lives. And so we decided not to decide anything ourselves, but instead wait for our bureau chief to return from his trip to the Kremlin. He will tell us what to think.